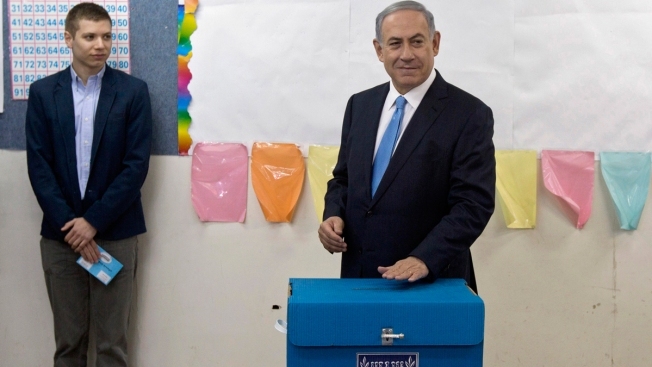 Facebook deleted a post by Yair Netanyahu last week in which he said he would "prefer" if "All the Muslims leave the land of Israel"
In this March 17, 2015, file photo, Israeli Prime Minister Benjamin Netanyahu, right, casts his vote with his son Yair during Israel's parliamentary elections in Jerusalem. Facebook has blocked Israeli Prime Minister Benjamin Netanyahu's son Yair for 24 hours after he wrote a post criticizing the social media platform as "thought police" and sharing previously banned content. Yair Netanyahu blasted the website on Sunday for removing an earlier post in which he called for "avenging the deaths" of two Israeli soldiers killed last week by Palestinian gunmen and calling for the expulsion of Palestinians. He shared a screenshot of the earlier post in violation of Facebook's community rules. Facebook deleted a post by Netanyahu last week in which he said he would "prefer" if "All the Muslims leave the land of Israel." Facebook had no immediate comment. Netanyahu's son has drawn media criticism for crude social media posts and a life of excess at public expense.